Hello everybody. 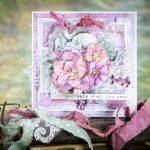 I am happy to be back on the blog today sharing a tutorial on an artwork I made using some of the dies from my Seth Apter Collection with Spellbinders. My artwork was inspired by my love of vintage book covers, which is the base for my piece Telling the Story. 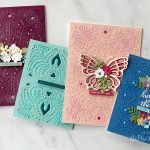 Book covers are the perfect choice as a substrate for art as they are primed to tell a story and often comes with distressed and frayed edges that are ready-made for mixed media. 1. Layer multiple colors of both opaque and translucent acrylic paint onto the surface of the book cover until you have the desired look. 2. Using an opaque acrylic paint, draw an imperfect plus sign on the surface. 3. Stamp the surface randomly using the Dot Matrix rubber stamp in your choice of several colors of ink. I chose to use StazOn solvent ink as it is permanent and will not bleed when I add wet layers on top of it. 4. Nest together all 3 dies from the Coffee Ring die set and run through the Platinum Machine with black cardstock using the manufacturers instructions. 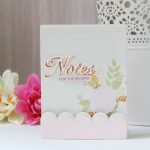 Do the same with the largest dies from both the Robo Ring and the Robo Bar die sets using blush cardstock. 5. Randomly stamp the surface of the die cuts using the Dot Matrix rubber stamp and Claret StazOn ink. 6. Using your favorite adhesive, adhere the Coffee Ring die cut to the center of the plus sign and glue the envelope string closure circle to the center of the die cut. Adhere the Robo Ring die cut around the Coffee Ring die cut. 7. Cut the Robo Bar die cut into three pieces and glue them around the edges of the book cover in your chosen spots. 8. Mixed a small amount of texture paste with paint. Add text to the book cover surface by spreading the colored paste over the word “story” from the Story Time stencil using the palette knife. Let dry. 9. Outline the edges of all the die cuts and the word “story” using the white and black pens. 10. Water down a small amount of white acrylic paint and splatter the surface by tapping on a small paintbrush soaked in the watery paint.